Preface. Chapter 1. Hops as a raw material in the brewery 1.1. Occurrence of hops 1.2. Origin and history 1.3. Hop as a botanical species 1.4. Hop as a commercial plant 1.5. References. Chapter 2. The alpha acids 2.1. Structure of the alpha acids 2.2. Composition and importance of the hop alpha acids 2.3. Biogenesis of the hop alpha acids 2.4. Synthesis of the hop alpha acids 2.5. References. Chapter 3. Reduced derivatives of humulone 3.1. Dihydrohumulone 3.2. Tetrahydrohumulone 3.3. Humulohydroquinone-humuloquinone 3.4. 4-Deoxyhumulone 3.5. 2,6-Bis (3-methylbutyl)-4-(3-methylbutanoyl)resorcinol 3.6. 2,4,6-Tris (3-methylbutyl)resorcinol 3.7. References. Chapter 4. Oxidized derivatives of humulone 4.1. Humulinone 4.2. Tricyclodehydro-isohumulone (TCD) 4.3. Compound 47 4.4. Compound 50 4.5. Compound 52 4.6. Compound 53 4.7. Compound 54 4.8. Compound 55 4.9. Compound 57 4.10. Abeo-isohumulones 4.11. Tetronic acid derivative 67 4.12. Volatile oxidation products 4.13. Latest contributions 4.14. References. Chapter 5. The isohumulones 5.1. Structure of the isohumulones 5.2. Formation of the isohumulones 5.3. Interconversion between isohumulones and humulone 5.4. Synthesis of the isohumulones 5.5. Importance of the isohumulones 5.6. References. Chapter 6. Reduced derivatives of the isohumulones 6.1. Dihydro-isohumulones 6.2. Tetrahydro-isohumulones 6.3. Neohydro-isohumulones and neohydro-isocohumulones 6.4. Compound 97 6.5. The rho-isohumulone 6.6. Compound 107 6.7. References. Chapter 7. Oxidized derivatives of the isohumulones 7.1. Non-volatile oxidized derivatives 7.2. Volatile oxidized derivatives 7.3. References. Chapter 8. Transformation and degradation products of the isohumulones 8.1. The allo-isohumulones 8.2. The hydrated allo-isohumulones 8.3. The acetylhumulinic acids 8.4. The humulinic acids and derivatives 8.5 References. Chapter 9. The anti-isohumulones 9.1. Isolation 9.2. Nomenclature 9.3. Structural proofs 9.4. Formation mechanism 9.5. Importance of the anti-isohumulones 9.6. References. Chapter 10. Degradation and derivatives of the anti-isohumulones 10.1. The anti-acetylhumulinic acids 10.2. Deacylated derivatives of the anti-isohumulones 10.3. Special derivatives of the anti-isohumulones 10.4. References. Chapter 11. The beta acids 11.1. Structure of the beta acids 11.2. Composition of the beta acids 11.3. Biogenesis of the beta acids 11.4. Synthesis of the beta acids 11.5. References. Chapter 12. Reduced derivatives of the beta acids 12.1. Hexahydro-beta acids 12.2. 4-Deoxy-alpha acids 12.3. 4-Deoxytetrahydro-alpha acids 12.4. Reduction products of colupulone with zinc : acetic acid : hydrogen chloride 12.5. References. Chapter 13. Oxidized derivatives of the beta acids 13.1. Oxidation with oxygen or auto-oxidation 13.2. Oxidation with chemical oxidants 13.3. References. Chapter 14. Derivatives of the beta acids in acidic and in alkaline conditions 14.1. Treatment with strong acid 14.2 Treatment with weak acid 14.3. Treatment with alkali 14.4. Treatment with very strong alkali at high temperatures 14.5. References. Chapter 15. The analysis of hop and beer bitter acids 15.1. Introduction 15.2. The analysis of hops and beer bitter acids 15.3 Samples to be analysed 15.4. Principles of specific alpha and iso-alpha acids analysis 15.5. Boiling methods for evaluating hops and hop products 15.6. References. Chapter 16. Analysis of alpha acids 16.1. Introduction 16.2. General problems related to alpha acids analysis 16.3. Problems related to the sample preparation 16.4. Problems related to the analytical procedure 16.5. Practical conductometric alpha acids analysis 16.6. Practical analysis of alpha acids by liquid chromatography 16.7. Micellar electrokinetic capillary chromatography 16.8. Conclusion 16.9. References. Chapter 17. Analysis of iso-alpha acids 17.1 Introduction 17.2. General problems related to iso-alpha acids analysis 17.3. Problems related to the sample preparation 17.4. Problems related to the analytical procedure 17.5. Practical direct photometry of iso-alpha acids 17.6 Practical LC analysis of iso-alpha acids 17.7. References. Chapter 18. The future of hop chemistry 18.1. Introduction 18.2. Liquid chromatography 18.3. Specific research possibilities for liquid chromatography 18.4. Capillary electrophoresis (CE) 18.5. Specific problems for CE 18.6. Sensor and probe techniques 18.7 In conclusion 18.8. References. Formula Number Index. Formula Index. General Index. 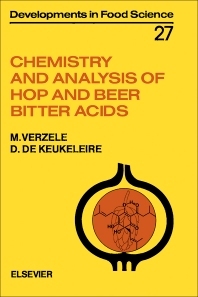 Largely based on laboratory work, the volume opens with a review on hops in general, while the bulk of the book covers the chemistry of the bitter acids of hop and beer. Practical, fully detailed procedures on the preparation and/or the separation of many of the compounds discussed are included. There is a chapter included on the complicated issue of bitter acid analysis, and several on the high-efficiency liquid chromatography of hop bitter acids. Bearing in mind the lack of literature produced recently in this field, the book is an excellent review of the present state of knowledge, and gives a large list of topics pointing to worthwhile studies for the future. The indexes provided will serve as a reference library-dictionary to hops, hop and beer bitter acids chemistry and analysis. This book has an amazing about of detail about hops and hop chemistry. At 439 pages, I use it as a reference but I haven't read it cover to cover. There is lots of information here I haven't been able to find anywhere else. I wish I could get a paper copy, but the electronic version was the only type available.